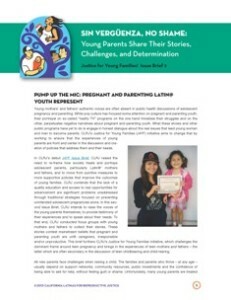 In this second Issue Brief, CLRJ intends to raise the voices of young parents themselves, to provide testimony of their experiences and to speak about their needs. Click here. CLRJ conducted focus groups with young mothers and fathers which resulted in the collection of rich stories that contest mainstream beliefs that pregnant and parenting youth are unfit caregivers, irresponsible and/or unproductive. This brief furthers CLRJ’s Justice for Young Families initiative, which challenges the dominant frame around teen pregnancy and brings in the experiences of teen mothers and fathers – the latter which are often secondary in the discussion of teen childbearing and child-rearing.